Great icosahedron. Model and image courtesy Robert Webb. Stellation is the process of constructing a new polyhedron by extending the face planes of a given polyhedron past their edges. 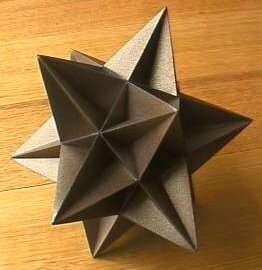 A stellation is also the new polyhedron thus obtained. Starting with the icosahedron, for example, there are 59 possible stellations, including the great icosahedron, which is one of the Kepler-Poinsot polyhedra.